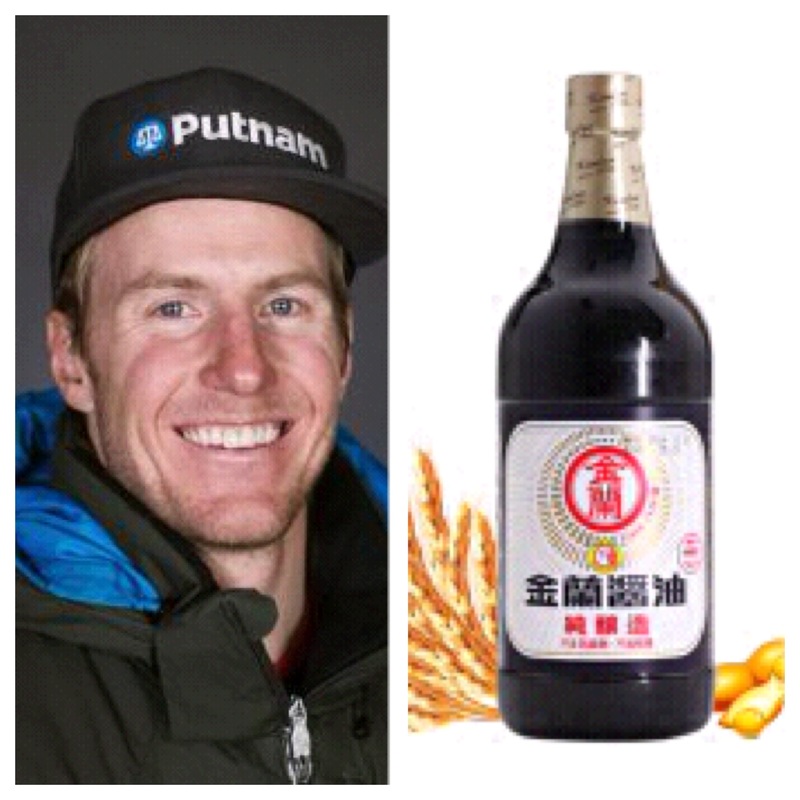 SORRY TED, YOUR TECHNIQUE ISN’T NEW - 欢乐灌水 Happy Pot - 同雪网 SkiChinese.com 北美滑雪论坛 - Powered by Discuz! While the NY Times video, Ligety on GS, made a good effort to explain Ligety’s superior GS technique, the Times suggested that Ligety’s technique is unique. The technique, which involves a transition phase between turns, is not, in itself, unique. What makes Ligety’s style unique is the geometry and physical characteristics of the new skis that facilitate the high edge angles he uses. The Times also failed to mention that most skiers can’t do what Ligety, Shiffirin Vonn and many other elite skiers have done since day one; use the external forces acting on them to advantage instead of fighting them. The issue isn’t a lack of natural ability. The issue is an inability to stand on one foot in a ski boot and especially to allow the foot to pronate. Unless one has a pathological condition that precludes this, anyone can easily do it. It’s what we do every time we take a step when we walk barefoot or even in most shoes. It’s standing on one foot in ski boot that’s critical to a technique that harnesses external forces. And it is the very thing that the rigid plastic ski boot and a whole industry associated with skiing is trying to prevent. The Times description of the differences between Ligety and his competitors (foes) perfectly describes the differences between Ligety’s technique that uses the external forces to advantage and the technique of his foes that attempts to fight the external forces, a losing battle if there ever was one. Ligety’s foes are forced to ski in violent fits and starts and to make adjustments that spray snow because the forces acting across their outside ski (and by default, across the joints of their foot and leg) are unbalanced. Because of this, the edge angle and forces acting on their skis and their base of support are constantly changing. Because the edge angle and forces acting on the ski are constantly changing, a corresponding series of small adjustments by the racer are required. This is especially true of the forces acting across the knee which manifest themselves as into and out of the turn oscillations. This is easily seen in HD video. In effect, the technique of Ligety’s foes amounts to a series of linked recoveries in which the most acrobatic racer prevails. Here is an excerpt from an article that Joan Rostad pieced together from a series of posts I made on the EpicSki forum. 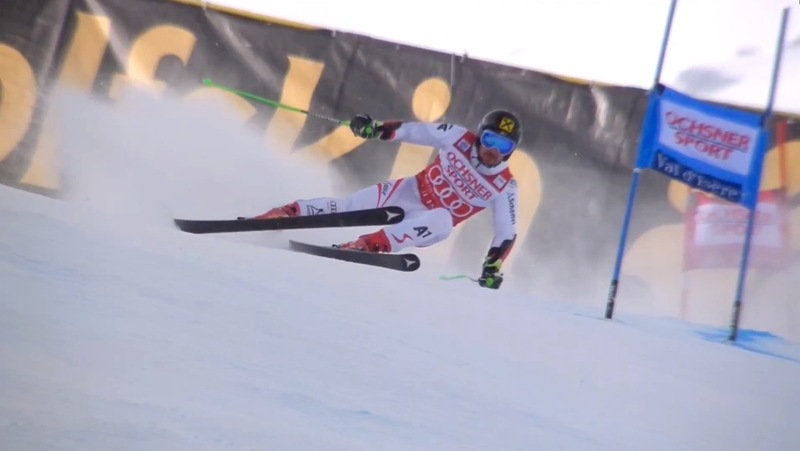 The article describes the essential elements of the techniques of Ligety and Shiffrin. Newton’s Law says, “A body in motion in one direction will tend to stay in motion in that direction unless acted upon by an outside force.” In skiing, gravity is always trying to pull us down to the center of the earth. The low friction base of the skis sliding on snow facilitates a shear force component of gravity that acts parallel to the fall line. You acquire inertia due to the acceleration. The turn effort creates centrifugal force, which wants to eject the skier off the tangent of the arc. The only thing stopping the forces from pulling you downhill is the internal force expressed in the outside leg against a ground reaction force (GRF), assuming balance exists. By my definition, balance is equal and opposite vertical forces aligned in opposition along the same force path with one net external force and one net internal force. Skiing involves more than just standing in place. We are moving from one limb (outside leg) to another. This basic form of locomotion is one of alternating single limb support, the same as walking. It wasn’t until I connected the movements of walking to those of skiing that I was able to perform and coordinate the movements with ease. When we walk and when we ski we have a stance foot and a swing foot. When you lift your foot to take a step the movement comes from the inertia of the movement of your center of gravity (CoG), but support from the new stance foot makes the movement possible. If you look at a skier in the middle of a turn the inside leg exaggerates the characteristics of the swing leg in walking. When walking, as you swing the unloaded leg forward, this foot naturally inverts. 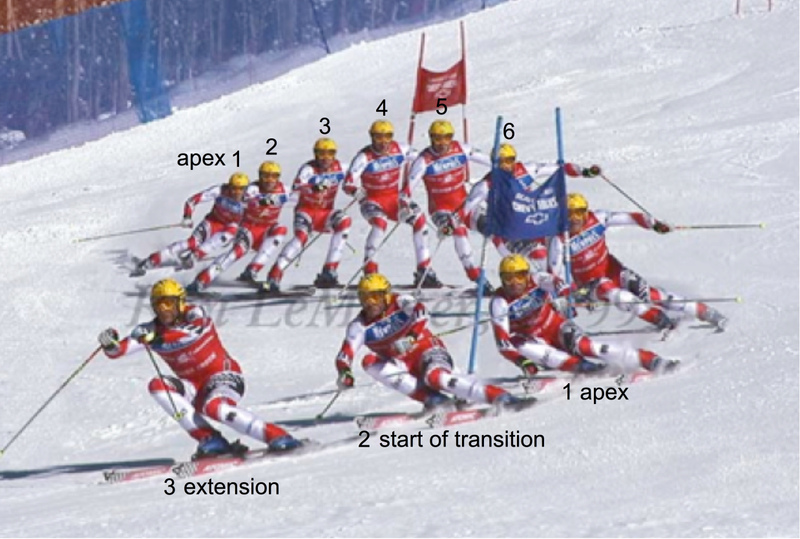 This is the same movement of release of the old stance foot in skiing. Even when constrained by the ski boot the foot will always try to invert when unloaded. Similarly, as you shift weight to your new stance foot in walking, so do you shift the weight in skiing: the weight first goes to the outside of the foot, and additional weight tips the foot to the inside, which helps to engage the inside edge of the outside ski. The foot’s anatomy is such that it must adapt to the transverse aspect first before it can fully accept the weight of the body. The lateral arch must make contact first and cause the foot to roll into pronation (i.e., evert) in order to tension the arches in the correct sequence. In the last third of the turn, CoG is behind the uphill or swing foot. So the initial active weighting will be on the heel. If the skier initiates movement down the hill by relaxing the support or stance leg while starting to extend on the swing leg, the force will start to drive the foot into eversion. The new stance foot needs to fully adapt to the supporting surface in order to generate a dynamically rigid base of support for CoG. Then the skier has to simultaneously extend both legs to get CoG up and over the ankle of the swing foot in order to unequivocally make it the new stance foot. It is important to note that the extension is gravity-assisted. Because (at the end of the turn) the uphill or swing leg is flexed in relation to the support or stance leg, we have an opportunity to extend away from the inertia of CoG–which is being pulled down the hill and down towards the center of the earth. It is important to understand that this is a lateral extension that moves our hips and core towards the center of the next turn, without up motion. We need this extensor effort to create the force in the foot against GRF to drive the outside foot into a pronated, stance position. This critical moment is sort of a twist on the line of the song New York, New York: “If you don’t make it here you won’t make it anywhere.” If you don’t drive the force in your foot to the ball of the big toe, it will be on the wrong side of the inside edge of the ski at its waist. This will create a situation where you will be using the boot cuff to indirectly transfer power to the ski, and doing so will cause a disruption to the balance system feedback and interfere with effectively skiing from the bottom of the foot. If you do not drive the force in your foot to the ball of the big toe, as soon as the external forces begin to build, the pronated position of your foot will reverse into supination and your foot will revert back to the adaptive state. Please be clear on this because the end result justifies the effort of extension. Try and visualize what is happening during extension of the swing leg. Your body is pivoting about the uphill or lateral aspect of the foot as CoG moves downhill and over the ski. You have to press with enough force to cause the foot to rotate faster. Additionally, elevating the inside hip greatly assists both rotation around the foot and loading the foot. In this scenario, both internal and external mechanics are pulling the stance foot into eversion and holding the edge. The whole lower limb is turning into the hill. By simply positioning CoG over the line of force where the ball of the foot is acting within the sidecut of the ski (think of it as literally a line extending from the point the flare of the ski starts to the point where it stops), the forces acting on the skier will reinforce the stability of the base of support even as the forces grow in magnitude. In other words, external forces that would normally disrupt the skier’s balance will have the complete opposite effect in this configuration. If the skier is using the inner (uphill side) of the boot cuff to hold the ski on edge then the action of the skier is opposing a force that is trying to rotate the stance foot into inversion away from the slope of the hill, which compromises her hold on the edge. 1. The pelvis always rotates about the ankle of the stance foot. In the first photo Norm Kreutz is rotating his pelvis towards the outside of the turn about the ankle of his stance foot. This is driving the inside or swing leg in the opposite direction, i.e., into the hill. In the second photo Norm is relaxing the stance leg and extending the swing leg. This transfers the support of CoG to that leg making it the new stance leg. This action transfers the point that the pelvis is rotating about to the ankle of the (new) stance foot. As Norm extends his legs the pelvis will draw his feet in the opposite direction that it was moving in the first photo. It is kind of like a power assisted rotary move. For this reason Norm does not want to plant his pole until after the extension has begun. This helps stabilize the position of his CoG to ensure rotation occurs in his femurs. The interesting thing is that this all happens on its own as part of the kinetic flow which should also flow in the direction that starts when the stance leg changes. Once you get the movement pattern right there is nothing to think about aside from deciding when to start a new turn. If there is one area where there seems to be general agreement it is that edging and pivoting occur as a unit movement pattern and not as a series of separate events spliced together. This is why the timing and sequence of the initial move to start a turn is important. Every turn has a start/end movement sequence that is consistently towards the inside of the turn just as there is a consistent flow in walking. Kick starting the flow is always contrived. This is why the first turn is the most difficult. The movement that sets up the direction of the flow starts in the feet. At the completion of a turn the flow is to the inside of the turn. To turn in the opposite direction requires that the kinetic flow of the joints of the body be reversed. The outside foot will be in pronation and the inside foot will tend to pronate. In other words the inside foot is already primed to flow to the inside of the new turn. When Maier relaxes his outside foot (first photo of the turn) his pelvis starts to unwind. This lets CoG drift behind his inside foot. Now CoG is behind his new stance foot and the foot is supported on its lateral or outer border. It is in the same position as it is at heel strike in the adaptive phase of walking. If you look at the movement of his upper body as he comes out of the fall line you will note that it seems to be coming at you (like a 3D movie) as opposed to going across the hill. If you were standing opposite the gate looking across the hill this would be more readily seen. As his CoG begins to move downhill Maier extends on his (new) outside foot. The foot is initially on its outer aspect but is tending to pronate. Applying force to the foot in combination with the movement of CoG starts the movement of the foot and leg in the direction of pronation. As CoG crosses over his skis his body will become erect with the slope of the hill. In effect, he is ‘standing up’. Remember, his inside femur was previously moving in a direction in relation to its position with the pelvis that was consistent with supination of the foot (i.e. as the swing leg in walking). The movement of the femur is in opposition to the joint movement of the foot (supination vs. pronation). Maier has to change the relationship of the pelvis to match the flow of the feet. 3. The pelvis always rotates into the stance foot whether in walking or skiing. As he extends on the new inside foot the tension of the rotator muscles in the pelvis unwinds the legs and aligns them with the pelvis, turning the legs into the fall line. As the turning progresses Maier applies rotational effort simultaneously to both legs to pivot the legs across the pelvis so that the inside hip leads the outside hip. In effect Maier creates the natural flow of the pelvis that takes place when one steps R foot – L foot, etc. At the same time he uses the extension movement to bring CoG up and ahead of the ankle of his new outside foot. By this movement Maier synchronizes the flow of the legs to match the kinetic flow of the joints of the outside foot (foot everted, leg turning into the turn, pelvis turned into the outside leg or towards the outside of the turn). Once he has synchronized the flow he exaggerates the rotation of the pelvis to reinforce the pronation of the outside foot as he relaxes onto the outside foot and stretches the muscles in eccentric contraction. 4. The flow of the feet is reinforced by the pelvis. Unless one has a reasonable knowledge of biomechanics the effect of the rotation of the pelvis on edging usually makes no sense because it seems to have nothing to do with the mechanics of the feet. The effect of this movement is that it shortens the muscles that drive the foot into pronation. This not only applies edging force to the ski, it also torques (twists) the ski about its long axis. This is why Maier’s ski bites positively at the shovel. If you compare him to lesser skiers you will typically see skiffs of snow being thrown up off the edges instead of flowing along the ski. This is caused by the percussion of the ski as it oscillates about its edge (into the hill – away from the hill). This is due to insufficient loading of the shovel. "Lightening is for learning, lifting is expert skiing." GMT-5, 2019-4-20 21:56 , Processed in 1.553350 second(s), 21 queries , Apc On.